Covering the essentials of all main group elements in organic chemistry, along with the synthesis and reactions of their organic compounds in just one volume, Organo Main Group Chemistry breaks important new ground. 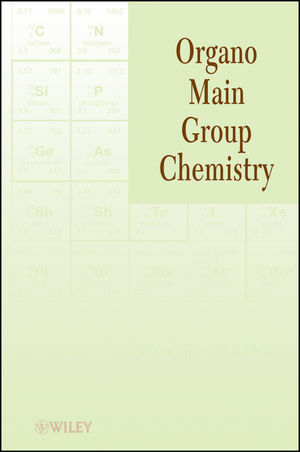 While main group chemistry has traditionally been classified as part of inorganic chemistry, this book establishes the organic chemistry of main group elements for the first time. The organic compounds of elements in the second period of the periodic table, which are centered around carbon, are the major components of animals and plants, while those in the third period and below also play key roles worthy of discussion when studying main group element chemistry. The major chapters describe synthesis and reactivity of organic compounds in the third period and below and are arranged according to the order of the periodic table. Starting with the role of lithium and magnesium cations, the chapters reach fluorine and iodine compounds. The first two chapters summarize the unique and common characteristics of main group elements in relation to carbon. The latter chapters deal with modern topics that address the unique characteristics of organo main group compounds. Suitable for professional researchers, chemistry professors, and advanced students, Organo Main Group Chemistry presents a novel new approach to the way we view both main groups and organic chemistry itself. KIN-YA AKIBA, PHD, is a Professor Emeritus in the Department of Chemistry at Hiroshima University and a visiting researcher at the Advanced Research Institute for Science and Engineering at Waseda University. Among his many honors are the 1996 Humboldt Research Award, the 1997 Award by the Chemical Society of Japan, and the 2000 Medal with Purple Ribbon by the Prime Minister of Japan.